British Men’s number 1 and Paralympian Wheelchair tennis star Gordon Reid MBE started playing tennis at the age of six, playing alongside his two brothers and sister at Helensburgh Tennis Club. In 2004, shortly before his 13th birthday Gordon developed transverse myelitis, a rare neurological condition that affects the spine. Undeterred, Gordon continued to play the sport that he loved. His determination and progress since his diagnosis has been inspirational. A little more than four years later Gordon would represent Team GB reaching the last 32 of the doubles wheelchair tennis competition in the 2008 Beijing Paralympic Games. Gordon’s rise to British Number 1 has been rapid. At the 2006 British Open he won both the Men’s Second Draw Singles and Boys’ Junior Singles and ended the year among the 10 shortlisted finalists for the 2006 BBC Young Sports Person of the Year. In 2007 he won the boys’ doubles at the Junior Masters in Tarbes, France and then the men’s singles at the North West Challenge in Preston to collect his first senior international NEC Wheelchair Tennis Tour singles title. 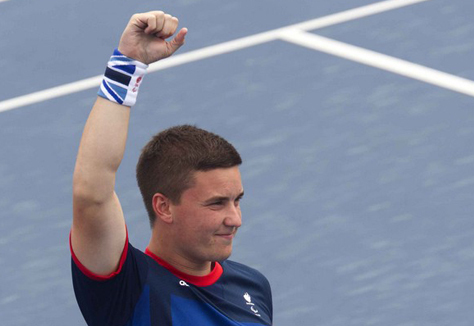 Gordon became the youngest National champion at the age of 15 in 2007 and in 2008, the youngest British men’s No 1, and youngest men’s tennis player selected to represent Paralympic TeamGB in a Paralympic Games (Beijing) at the age of 16. In 2009 Gordon became world No 1 junior in the boys’ singles rankings, a position he maintained throughout his final season as a junior, and was named Tennis Scotland Junior Male Player of the Year and in 2010, Tennis Scotland Disabled Player of the Year. By 2011, Gordon had reached a career high singles ranking of no.11 and had won two ITF2 titles. 2012 was to prove a remarkable year for Gordon. Ranked as the British Number 1, he was selected to represent TeamGB in the London 2012 Paralympics, his second consecutive appearance at the summer games, reaching the quarter finals in both the men’s singles and doubles competitions. He finished 2012 with a world ranking of 8, making him the joint highest ever ranked British men’s player in the sport. In 2015, Gordon won his first Grand Slam Titles winning both the French & US Open Doubles titles. In July 2016, Gordon made history as the first man to win the inaugural Wimbledon Men’s Wheelchair Singles Championship. His victory over Sweden’s Stefan Olson came less than 24 hours after he had clinched the Men’s Doubles title with partner Alfie Hewett. 2016 was made even more remarkable as Gordon won a Gold and Silver medal at the Rio Olympic Games, was awarded the freedom of Argyll & Bute, ended the year as the World #1 in the Men’s Singles rankings and was awarded an MBE in the New Year’s Honours list.